Designs by Lisa Somerville: Beyond the Sea - Birthday Blog Candy! Beyond the Sea - Birthday Blog Candy! Okay, so it's NOT my birthday, but there are quite a few people I know celebrating their birthday today, so why not give away a present! Today is actually my Father-in-Laws birthday, but I don't foresee him stamping, so we gave him a different gift, and I've a brand new Beyond the Sea plate from Artistic Outpost to give to one lucky blog reader! Be sure to read the bottom of my post on how you can enter to win this wonderful plate! I had a different technique in mind when I started my card, but it just wasn't working out like I planned, so I got a little creative and ended up with this wonderful Spritz and Flick background using the beautiful Lighthouse from the Beyond the Sea plate. I added the Distress Inks (Broken China, Wild Honey, Mustard Seed and Crushed Olive), then stamped the image in Black Archival and finshed with the water flicks. 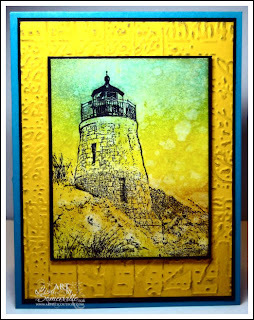 The Yellow panel under my image is embossed with a Texture Fades Folder, then highlighted with Old Paper Distress Ink. So how can can you win your own Artistic Outpost Beyond the Sea plate? Just click here to view past Artistic Outpost projects I've created and tell me what your favorite one is, or tell me what your favorite Artistic Outpost set is (you never know what else I might through in with this plate). I don't have just one favorite set, I could probably narrow it down to a few. If you have a chance to see the August Issue of Crafts N Things, you'll see two wonderful projects I created using images from Birds of a Feather, one is a card, the other a Brooch using a Bezel from Scarlett Lime and some Ice Resin. Be sure to leave your comment on this blog post by Wednesday, June 23rd to be entered to win. I'll have the random number generator pick the winner and post on June 24th. Be sure to check back then to see if you've won. I just luv the colors on this! Great giveaway, and Happy un-birthday!! Good golly, this is soooooo beautiful. My fav set is the new Alice in Wonderland set. Wow such a great giveaway! As far as picking one of your creations as a favorite, can't do that, too many!!! Today's card with the spritz and flick background is wonderful! Love the colors! Lisa asking me to pick your favorite piece of work is not fair! I love them all! I can not pick my favorite Artistic Outpost set - but I will say the one I use the most is the Send in the Clowns plate. by the way - this card is just lovely! I love how this turned out Lisa. A perfect image for this fantastic background. I have several favorites. Serenity is an all time "old" fav, and I really gravitate to Home and Country Life. Thanks for the give-away. I am a very happy subscriber to your blog. Have a great rest of the week. Saw this on SCS and thought it was amazing! This is gorgeous!! Can I cheat and say that EVERYTHING you make is my fav???? Well, it would be more true than cheating! LOL! Okay, I LOVE the card you did for the blog hop on 1 JUNE. (Your coloring with the blue b/g is awesome!) A close second is the lighthouse you did 26 MAY for the release. As for my favorite set it would be The Outpost, it is timeless! Thanks for the opportunity for some blog candy and Happy Birthday to your FIL! Lisa, your use of color on this card is amazing. It is my favorite Artistic Outpost one you have done recently! The Spritz and Flick technique is perfect to continue the theme of Beyond the Sea! Thanks for the giveaway...please pick me! So fun to look through your Artistic Outpost gallery ... I love them all, but I always gravitate back to the cards you make with the Snowy Woods plate ... so gorgeous. This card is so great! I love the super bright colors...they totally switch things up. This is amazing. I received "Crafts 'n Things" magazine in the mail yesterday. I did not subscribe to it. No one I know gifted it to me. I figured I was on someone's mailing list, and they sent it as a "Free Trial." I look at your entry for today and you mention it. I found you on pg. 80! I opened the book up and it showed another friend's work, too! Coincidences? I don't believe it them! I looked through many of your awesome cards, Lisa. I really love the "Bloom Where You Are Planted" stamps from Artistic Outpost! Thank you for the opportunity to try to win...and for such great candy! Pick one? Are you crazy? (now I know I won't win...) I've been drooling over your recent Beyond the Sea cards! The one today is stunning! 1. Home & Country images- car with chickens using Glimmer Technique. 2. Bloom & Grow images - chickens on farm with saying keep growing. 3. Beyond the Sea images - lighthouse(beautiful image) with girl in foreground using your favorite technique markers coloring. 4. Sea Plate image - somewhere over the sea card with faux brad (great idea) and Burnt edges technique. I'm relatively new to Artistic Outpost but I love so many of their stamps. . . it's impossible to choose! Maybe The Outpost. Oh I just love 'em all. Much the same, choosing one of your cards is certainly a challenge! I do love today's so much ~ it's beautiful. I really love this card...the spritz & flick background turned out great! Awesome color choices! I love how you keep us up on all of the new stuff! My favorite set right now is the Old Grist Mill mainly because I collect covered bridges. I just love the detail in all of their stamps! I think Generation Redux is my favorite AO set, followed closely by Birds of a Feather. I have used both many times in the short time I've had them. It's my sister's birthday too!!! I really admire the jewelery that you make with the Artistic Outpost images. I own a few plates and they still scare me. I don't know why. I tell myself it's just ink and paper. I love the Beyond the Sea set as well. I used to take a vacation to the Oregon coast every year but haven't been able to for quite some time so those types of images remind me of some great times. When I get a little money and am ready to place an order though, it will be the Bloom and Grow set. They are so many beautiful images in that set and gardening is my second favorite hobby. Now that I've written a book, I'll stop by saying that I really love your artwork. It seems that you use watercoloring techniques a lot which is my favorite medium! This is gorgeous. Love when you create these beautiful backgrounds of color with the lovely images overlaid on top. Beautiful! Your card is lovely! I went to the Artistic Outpost site to check out the stamps - I like Beyond The Sea, which you used here, for the lighthouse image (I don't own any!) and Lovely Day for both the images and quotes! Love the technique used on the Beyond the Sea Lighthouse card! It goes so well with the theme...watery and all! Thanks for the giveaway..
What a great giveaway. I like AO stamps but don't own any so it would be great to win some. I really like the Route 66 card (and set) and also the Cutie Pie one. Beautiful card!! My favorite set from Artistic Outpost is Birds of a Feather!!! This is a fabulous, vibrant card Lisa! My favorite recent AO card you created is the lighthouse card using the Spectrum Roll technique - it's beautiful!! I really like the card on this post with the lighthouse on the spritzed background. I don't have any AO stamp sets but have a few on my wish list. Although I do like the new stamp sets, the Keeper set still is my favorite. THIS IS MY 2nd POST--I'm not yelling, just trying to make sure you know. I just saw a set of stamps that blew me away. I am hoping you would add it to the one I listed in my previous comment. I absolutely love "Birds of a Feather!" I have been searching for a nest...with eggs and a bird that the size of the nest would work with. I bought a Robin Egg Blue colored copic, and can't wait to use it. I hope you will not count me twice in this drawing, as this is not my purpose.